The Rt Hon Nick Clegg MP and the Rt Hon Vince Cable MP visited the Northwest Automotive Alliance (NAA) stand at the event to learn more about the exhibitors and the region’s thriving automotive industry – and about how support from government initiatives has helped regional supply chain companies to grow. NGF Europe was one of the proud exhibitors that have received funding from the Advanced Manufacturing Supply Chain Initiative (AMSCI), a funding competition designed to improve the global competitiveness of UK advanced manufacturing supply chains. Thanks to a £4 million investment – aided by a £528,000 AMSCI grant – NGF Europe is now the first fully-integrated, high tensile strength (HTS) glass cord manufacturing factory in Europe, and the only such facility outside Japan. The BIS Manufacturing Summit 2014 reviewed UK manufacturing and hosted business leaders and government ministers. It took place as part of Liverpool’s International Festival of Business. 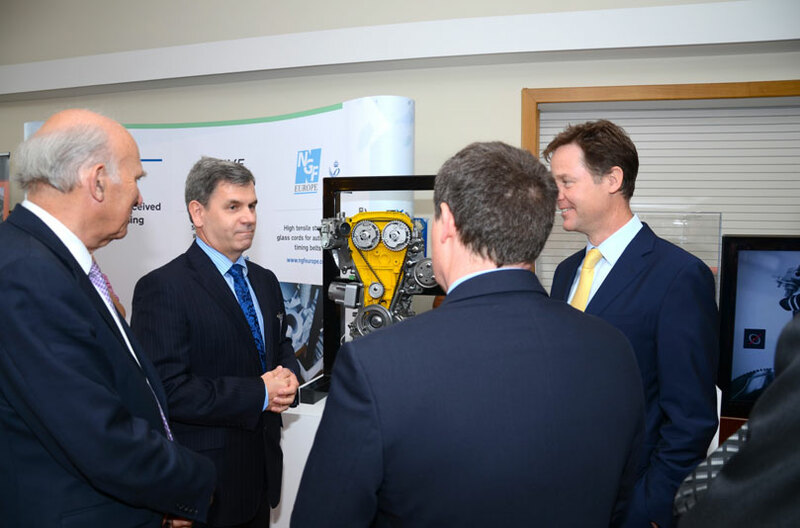 The Deputy Prime Minister Nick Clegg and Vince Cable, Secretary of State for Business, Innovation and Skills, learn more from Alistair Poole about the success story of Belt in Oil.